Do you export the dryers? What kind of warranty comes with the dryer? Which dryer is best for me? I am using DTG machines (Annajet, Epson, Brother, TexJet, Resolute Rjet etc) , which dryers can be used with DTG inks? Can I cure both Plastisol and Waterbased Inks? Can I use the dryer to dry solvent based inks? Do I need air re-circulation? I am using UV inks, what machine do I need to cure the ink? I have automatic carousels should I choose Electric or Gas? Will you install the dryer? Do you make custom sized machines? Do I need air extraction / fume extraction? Can I use a 13amp plug? What kind of socket do I need to get installed? Do you sell dryer spares? How do I replace the brushes on the motor? Do you sell second hand machines? Do you convert dryers from three phase to single phase and vice versa? Do you re-condition old machines? Some smaller dryers are made to stock, so a quick turnaround is possible. Larger dryers are made to order, we do quote a typical lead time on order. We do our best to build machines as quickly as we can. Yes we regularly export Tunnel Dryers to Europe, Middle East and Africa. If you are outside of that geography then please contact us. Please note that in circumstances there will be a crating charge in addition to shipping charges. The dryers come with 12 months onsite, and 4 years back to base warranty (excludes consumables such as motor brushes etc.). You can optionally purchase a service contract for peace of mind. Please click here to see link which helps you choose the right dryer. If in doubt please contact us for advice. You can use the 700L compact, 700L, 700LW and the 8000 series dryers for curing DTG inks. You can’t beat wash tests – it is the only sure way to check that the ink has cured correctly. There is a simple test for Plastisol inks, you can do this test by simply stretching the fabric. Print a complete film of ink and dry it. Hold the printed fabric up to a strong light and stretch it. If the fabric will stretch about 60-80% without cracking the ink then the cure is OK. For Waterbased inks and DTG inks try scratching the print with your finger nail, if the ink starts to break off you know it is not cured. Smaller dryers such as the Mini and 700 series machines are great for curing Plastisol inks with a single pass. If you are using water based inks you will need to put the garment through at least twice. Some waterbased ink ranges like Magna Colour and WPS SuperFlex WB inks have crosslinkers or curing additives which you can use to cure garments with a single pass. The 700L, 700LW and 8000 series will all cure waterbased inks with a single pass through the dryer. Yes you can use our dryers to speed up the curing process of solvent inks such as Nylobag / Vinyl inks etc please be aware that solvent based inks have a low flash point. Always ensure that the extractor fan is working correctly and avoid print on large surface area e.g. A2 sized prints. Generally speaking no, however air re-circulation is optional on the 700L and 8000 series dryers and can increase curing productivity and efficiency when using waterbased inks. In practice the vast majority of dryers are shipped without rec-circulation and are used the cure waterbased inks both screen printed and digital without issue. Our range of dryers are designed for heat cured inks, we can supply UV dryers – click here for more information. There is a common misconception that if you are a large screen printer that you have to use a Gas dryer. This is not the case as Infra Red dryers are very efficient and when to temperature run typically between 30 – 40% utilisation. The initial purchase price of an infra red dryer is significantly lower and the ongoing maintenance costs are a lot cheaper, and of course to use gas your studio or factory needs to be connected to the main gas supply where all locations have access to electricity. To find out the cost of running a tunnel dryer, find out how much you are paying per Kwh e.g. 0.10p per KwH so to run a 700L (approx 10KW) you would be looking at around £1.00 per hour. Please note that in practice you would be running the dryer around 40% utilisation but gives a view on potential costs. The larger 8000 series dryers are ideal for larger screen printers, they are easy to maintain and cost effective. We will deliver to your machine if agreed as part of the order. We also prefer to make sure the machine is working correctly before we leave. Please note that legally the customer is responsible for the electrical connection to the dryer. Our smaller range of dryers can use Single or Three Phase power. The larger 8000 series are three phase only. Please consultant an electrician to ensure you have ample power capacity prior to purchasing a dryer. If you have Three Phase power coming into your premises we also recommend that you choose a Three Phase Dryer. This will save you money in the long term. Yes you do, all of our dryers have extractor fans and we highly recommend that you vent the fan externally. 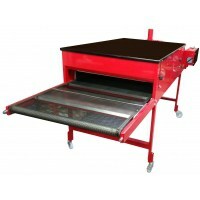 You can purchase cost effective fume from i-sells.co.uk product code is GALSRFG1-80 (80mm for Smaller Dryers). We can manufacture the Mini dryer to 13amp specifications, however we highly recommend that you install 16amp or more as the more power the quicker the dryer will cure the ink. A more powerful dryer will save you money in the short term. Yes we sell the common spares online, if you are looking for parts not listed please contact us and we will do our best to assist you. Please click here to see guide for replacing brushes. We suggest replacing the brushes every 18 months. Yes we can convert the smaller mini and 700 series dryers.